Every morning, I get up and read my Bible. Next, I have two devotions I read and forward to my husband. Finally, I write in my prayer journal. I do all of this in pajamas and bathrobe, coffee beside me, sitting in an incredibly comfortable recliner, draped with a blanket, and more often than naught, my sweet dog Beth leaves her spot in the bedroom to join me. When the weather warms up some more, I’ll move my morning study and prayer time out to my back porch, to a comfy Adirondack chair, and if it gets too humid this summer, I’ll turn on the ceiling fan. That it took me so long to “find time” to do this makes me cringe. What a privilege to spend my first hour with God, to bask in His graciousness and mercy… to learn more about Him… to read the words of Jesus, and to study how the Holy Spirit works in our lives when we let Him. 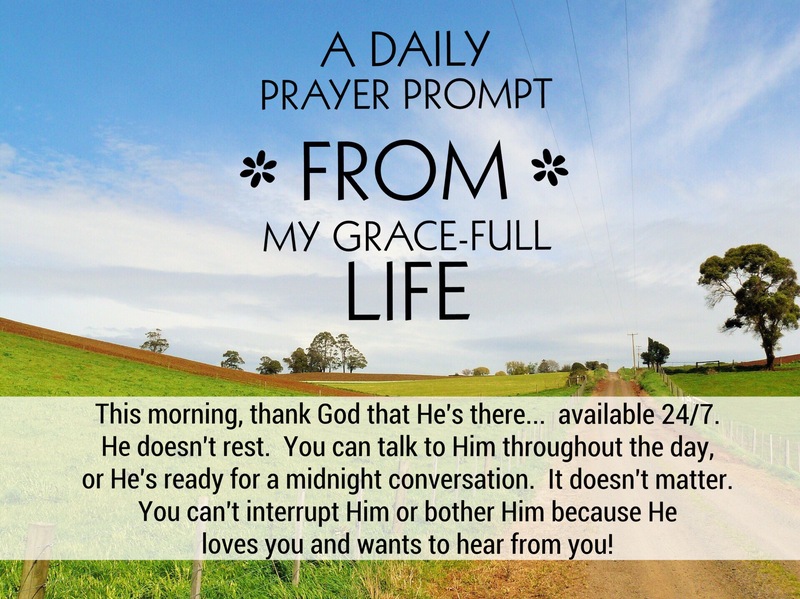 As you pray today, take a moment to thank God that He’s accessible 24/7… whether you are still in pjs sipping coffee, or crawling into a warm bed for the night. He’s there if you’re working at a computer or bent over digging in a garden. Whether you’re traveling by car, plane, train, or bike — He’s there. Everywhere. Everyday. Anytime.